Franchise re-sequel Rise of the Planet of the Apes was a celebration of success in rebooting an almost-fifty year-old franchise. Competently written, dramatically engaging and fitting the tone of evolutionary success, its emotional resonance added surprising depth to what could otherwise have been another cash-in full of Hollywood bombast. Unlike its predecessor, however, Dawn of the Planet of the Apes’ profundity is at its forefront, delivered with surprising panache by Cloverfield director Matt Reeves. The films’ extensive use of performance capture to portray the apes is more than a flashy delivery method. It is crucial in painting a drab, murky picture of the impending war between man and ape. CGI apes commandeered by real actors fighting a war against humans. This is an impending war with no desirable victor. While satisfaction will come from seeing an aggressive, violent group of people defeated by the very creatures they have been torturing, the thought of human eradication is far from pleasant. Set 10 years after Rise, the worldwide pandemic of the ALZ-113 virus (known as the Simian Flu) has led to the complete destruction of human civilization, following civil unrest and a global economic collapse. 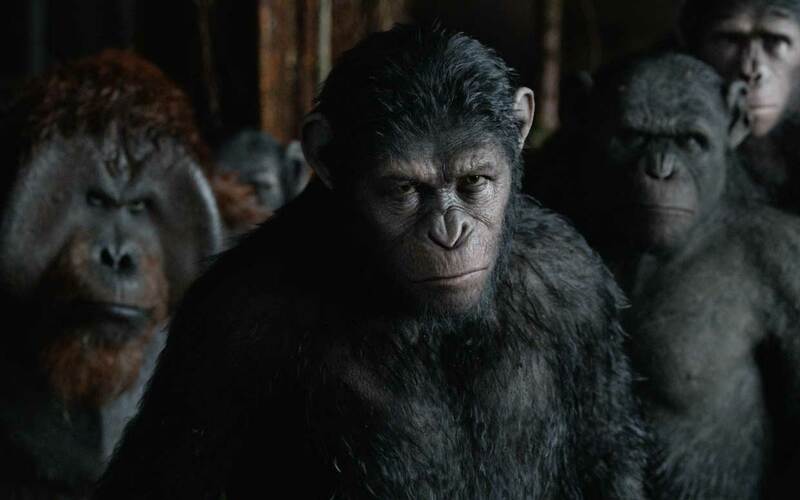 Almost all human life has been extinguished, while Caesar (Andy Serkis) leads and governs a new generation of apes with genetically enhanced intelligence. After a brief encounter with a group of humans led by Malcolm (Jason Clarke), tensions rise within both human and ape camps as Malcolm sets up base in an abandoned dam in the middle of Caesar’s fledgling civilization. Its plot is familiar and overly predictable, and its human characters are far from fully-realised, but the film’s centrepiece, the apes, are its biggest strength. Reeves approaches Dawn with the finesse and style both film and franchise needed. Known for Let Me In and Cloverfield, he has a far from distinctive style, which allows him to promulgate his adaptability – departing from the wobblecam delirium seen in Cloverfield, to the somber placidity of Let Me In – yet leaves mystery as to his identity as a director. His approach to this film is clear and personal with ardor, and his desire to bed the fantastical with the ordinary is obvious. With daring, intense closeups of his primate leads, Reeves creates in his apes a sensibility and in his audience, feelings of remorse, an intimate swell of penitence. We cease to be charmed by the quality of the CGI and its blockbuster sensitivities and are, in a matter of minutes, enthralled by performance. As the apes interact, both with each other and humans, the two worlds begin to converge and Reeves’ genre nous ensures blanket, indiscriminate tension with no sacrifice to emotion, human or ape, creating a tapestry of thoughtful, genuinely heart-rending moments, concluding in a triumph of modern cinema.